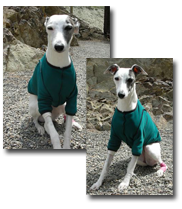 In the fall of 2005, my little friend, Coco Whippet, was diagnosed with Chylothorax disease. She needed extensive surgery to her chest area. The surgery was very successful but she had a really big, scary incision. 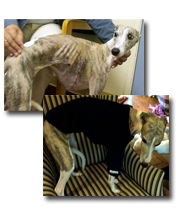 During the long recovery period, Coco wore a DogGoneChic BodyShirt® to keep her warm and protect the surgical incision. The shirt did the trick and she did not have to wear one of those satellite dishes on her head ! 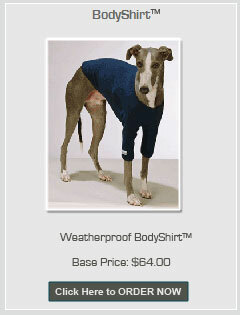 Coco was comfortable and stylish in the ready to wear DogGoneChic BodyShirt®. Thank you, Tricia and Pennier for designing such a versatile garment for dogs ! Free Range Whippets – Whippet Rescue/Oregon. After an unfortunate run-in with some barbed wire Emma found herself nursing 6 stitches at the top of her leg. Sentenced to wear a head cone for 2 weeks I ordered her a body shirt and now her wound is protected from dirt and more importantly, protected from her licking. Emma is comfortable and cone free while her wound heals. The BodyShirt® is Dog Gone amazing. Thanks Trish! It’s as though he smiles when I put on his BodyShirt®. It’s made of such comforting fabric and I think he knows he looks good in it. I love that it’s made so that he can’t pee on it. And another nice thing is that there isn’t as much fur around my house when he’s wearing his shirt. Mirabel loves hunting in the woods but unfortunately she suffered an allergic reaction to a seasonal grass in the summer. The unsightly rash all along her chest and the tops of her legs rendered her itchy and in distress. But thanks to the BodyShirt, Mirabel wasn't able to access and scratch her rash. Plus, the soft fleece on the inside comforted her as she healed. Thanks so much for designing such a stylish, yet functional garment. The custom coat for our Golden Derby fits great. He has been leaving his sore leg (lick lesion) alone and seems to be much happier. Thanks. Simon has been with me for three years. Very itchy dog, currently w/ skin breakout being addressed medically. When he has his BodyShirt on, itching is reduced by at least 90%. I was at the vet today and he was fine in his shirt. I took it off and he was immediately scratching. Put it on after the exam, and he immediately stopped any and all scratching. Form-fitting, 4-way stretch with soft fleece nap worn on the inside; smooth, durable and weatherproof outside. Practical chic design can be worn AFTER healing as everyday protective yet fashionable BodyShirt®.